If you’re trying to decide between the Lily Cup and the Lunette Menstrual Cup, you’ve come to the right place! We’re going to give you all the information you need to decide between these two popular European-Made Menstrual Cups. It’s a battle of the old vs. the new. The Lunette Cup, made in Finland is one of the oldest, most established menstrual cup brands. They’ve been around for years, and have a reputation for making a top-quality period cup that people love. It’s often the first cup that people try, and many people end up sticking with it for the rest of their lives. The Lily Cup is a newer menstrual cup that’s made in Sweden. It has a bit of an unusual design in that it’s not really a bell-shape like the Lunette Cup. They also make a collapsible version, which is an interesting option. Will either of them work for you? Find out Which Cup Will Work for You! Keep on reading for our full review of the Lunette Cup vs. the Lily Cup to find out which one makes the best choice for you. The Lily Cup comes in two different models, and each model has two different sizes for a total of four distinct cups. 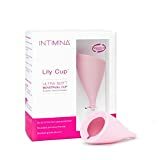 There is a regular Lily Cup which is similar to the Lunette Cup, and most other menstrual cups. There’s also the Lily Cup compact which is the only collapsible menstrual cup on the market today. We’re not really sure why you’d care about whether or not your cup was collapsible, but if you do, it’s the one for you! In our opinion, it’s a little bit gimmicky, especially when you consider that many people find it too soft to actually work that well. Menstrual cups are actually very small and will fit easily into your backpack or purse, even if they don’t collapse. Both models come in size A (small) and size B (large). The smaller size is if you haven’t given birth vaginally, while the larger size is for you if you have. The Lunette Cup comes in two different sizes: Model 1 (small) and Model 2 (large). The company recommends the smaller one for people with a light to normal flow. The larger Lunette Cup is for people with a normal to heavy flow due to the slightly higher capacity. In terms of sizing, the Lunette Cup is pretty standards in in the menstrual cup world in terms of length, diameter and capacity. It’s quite similar to the Diva Cup, although the small Lunette cup is slightly smaller and shorter than the small version of that popular cup. Most people will find that the Lunette Cup works well for them. Even if you have a shorter vaginal canal, it’s easy enough to trim the stem on your Lunette Cup and make it shorter. The Lily Cup, however is very different! The collapsible Lily Cup (compact) has a very small capacity and is also very short in length. If you have a heavy period, you’ll want to give this one a pass because you’ll find that you have to change your cup too often. The short length of the Lily cup compact can make it a nice option if you have a medium-short vaginal canal. At 58 mm in length, it’s a full 10-15 cm shorter than average length menstrual cups. The diameter and capacity of the regular Lily Cup is pretty standard. What’s different about it is the length. At 78 mm, it’s one of the longer menstrual cups on the market today. If you have a long vaginal canal/high cervix, it might be an excellent choice for you. Not sure? Stick your index finger into your vaginal canal. If you can’t touch your cervix, you have a high one and could consider this cup. Have a longer menstrual cup helps when removing it. Normally you’d remove a menstrual cup by grabbing the base of the cup, squeezing in with two fingers to break the suction seal, and the pulling it out. However, if you have a long vaginal canal, you may not be able to grasp the base of your period cup. In this case, you’d grab the stem and pull it down gently until you could get to the base. Having a cup that is too short for you will make even this quite difficult. In terms of design, the Lunette Cup is a pretty standard bell-shape. However, the Lily Cup is more of a funnel. Some people prefer the bell-shape, while others prefer the cone shape. It really is up to you! However, one major disadvantage to the Lily Cup is that if the cup is too long, you can only trim the stem a very small amount. With the Lunette Cup, you can trim the stem to make the cup significantly shorter. With the Lunette Cup, you also have the option of trimming the stem entirely, and turning it inside out. This is an excellent option if you buy a regular length menstrual cup and find out that you actually have a low cervix. This isn’t possible with the Lily Cup. Overall, it’s not easy to make the Lily Cup shorter by more than a few millimetres. Lily Cup vs. Lunette Cup: Lunette for the win in terms of design! Soft, and firm menstrual cups both have their advantages and disadvantages. A soft menstrual cup often feels more comfortable when it’s inside you because it doesn’t press strongly against your vaginal canal walls. If you’ve experienced cramps with some of the firmer period cup, you may want to give a softer one a try. However, soft menstrual cups like the Lily Cup, or Lily Cup Compact are generally not recommended for beginners because they can be a bit difficult to insert. This is because they don’t just “pop” open, but you may have to fiddle around with them a bit to make this happen. On the other hand, firmer cups like the Lunette Cup are easier to insert because they just pop open. However, they might feel uncomfortable because they can press strongly against the vaginal canal walls. Lily Cup vs Lunette Cup: Which one is the Winner? If you take a look over on Amazon, you’ll see that people seem to REALLY like the Lunette Cup. It has an excellent overall user rating, and some great individual reviews. The negative reviews for the Lunette Menstrual Cup are mainly from people unhappy with menstrual cups in general, and not this specific product. Many people buy the Lunette Cup for their first menstrual cup. It’s has a nice firmness, and most people find it easy to insert, but also comfortable to wear. It’s durable, doesn’t leak, and is overall, an excellent cup. Many people often end up sticking with the Lunette Cup for their entire lives. On the other hand, if you take a look at the regular Lily Cup, or Lily Cup Compact on Amazon, you’ll often find that overall user ratings are slightly lower. In addition, there are many people who have a hard time inserting these cups because they’re so soft. A lot of people comment that the Lily Cup is a bit of a struggle to get it to open fully. If your cup doesn’t open fully, it’ll leak like crazy and many people seemed to have this experience. Lunette Cup for the Win! It’s for these reasons that we recommend the Lunette Cup over the Lily Cup, or Lily Cup Compact. It’s not like there’s a perfect menstrual cup for everybody, because there are so many different body types. However, the Lunette Cup comes pretty close and will work well for the vast majority of people. Lily Cup vs Lunette Cup? The Lunette Cup for the Win! Lunette Menstrual Cup vs. Lily Cup: Have your Say! Let us know your thoughts about the Lunette Cup vs. the Lily Cup. Which one are you going to buy? Why? Leave a comment below. Also be sure to give this article a share on Facebook, Twitter, or Pinterest.